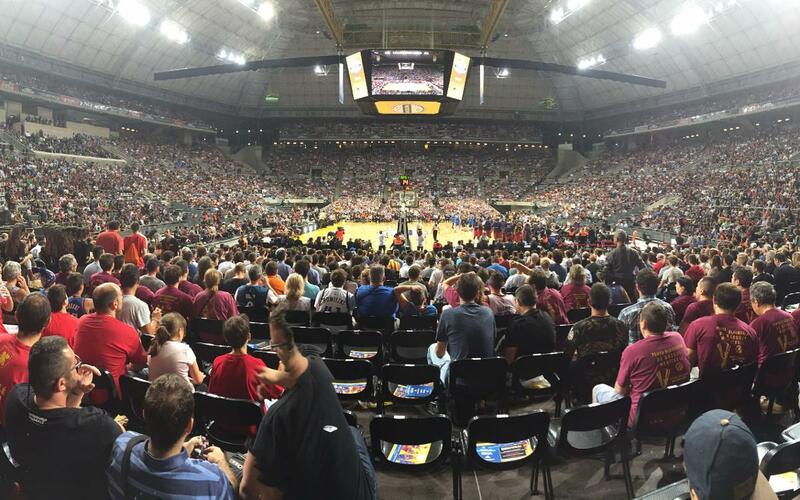 On Wednesday night, inside Palau Sant Jordi, the NBA was omnipresent. For one night, the National Basketball Association took over the whole place. They brought the Oklahoma City Thunder, they brought the rules — four 12 minute quarters, six personal fouls, longer three-pointers, and relaxed enforcement of traveling violations — heck, they even brought the court itself (by air, in case you were wondering). The Thunder’s star player, RussellWestbrook, wore the number zero. Zero? You can wear that in a basketball game? It was ironic, because while zero has no absolute value, Westbrook was absolutely incredible to watch. At the 1:28 mark of the first quarter he drove from the wing into the lane with the power of a Spanish bull and then, at the last second, smoothly dished off to a teammate for an easy layup. On the next possession, he went all the way, taking off barely a step inside the free-throw line, arms spread out like an eagle — legs spread out like an eagle! — before he threw down, pardon the pun, a thunderous slam-dunk. A better way to get the crowd into a basketball game there is not. At the end of the first quarter, the Thunder’s shaggy mascot, Rumble the Bison, took over. A lucky few from the crowd came onto the court and challenged the thick-tufted buffalo to a dance off. Nobody knew who won, but it didn't matter. The Catalans led the game, 32–28 at the 8:51 mark of the second quarter. Some people may have been surprised to see the Thunder, given their pedigree, trailing the European outfit. The Thunder, however were not just battling FC Barcelona but, undoubtedly, a hefty dose of jet lag, as well as a taxing 142–137 defeat just 48 hours before in the Spanish capital. During one stoppage, the scoreboard above center court played a hilarious video, in which fans in an arcade tried their luck at a claw crane machine. But the chrome jaws came up not with a cute little stuffed animal, but the aforementioned giant, bushy Bison. The victims of the video prank cowered in fear. The fans at Palau Sant Jordi, however, were thoroughly amused. Barça were still up, by just two, at the half. Westbrook looked primed to take over the game. He stutter-stepped. He juked. He busted out an arsenal of moves not often seen this side of the Atlantic. But the shots? They were loath to fall. That’s what 5,089 miles (8,189 km) — the distance from Oklahoma City to Barcelona — and a seven hour time difference will do to you. Whereas at the opening tip off a smattering of empty seats had yet to be occupied, by the end of the third quarter — when there were no more souvenirs to be bought, no more hot dogs, popcorn, or soda to be consumed — the place looked about 95% full. Not bad for a school night. You know there were plenty of kids in attendance when you go to buy t-shirts for your own two sons only to be informed children’s sizes are sold out arena-wide. In the fourth quarter, former FC Barcelona striker BojanKrkic made an appearance — on the kiss cam! It was a great shot and, yes, he scored. Back on the court, a nail-biter was in the making. The Thunder held a 90–89 lead with 43 seconds left. Thunder shooting guard Alex Abrines — the former Barça player — tried to extend the lead, but his 22-foot jumper was slapped back in his face. Not exactly a warm welcome home. With three seconds left, Barça went for a three that would have given them the lead, and likely the win. It rimmed out. The crowd oohed. The Thunder pulled out the victory. But it didn’t matter. The NBA’s cleverly contrived scheme to enliven and entertain from tip-off to the final buzzer — on the court but mostly off it — was stupendously successful. Not so simple, but oh, so pure.